Let’s hope no one has a chance to brainwash her into hating people. True my friend. Isn’t hate such a waste of energy and brain cells? I’ve been reading your blog for a while, but I thought I might respond to a few posts from time to time- especially now, since it seems like there’s so much going on these days. And your latest entry touches on something I’ve been thinking about these days. Simply put, why is this child mixed? Usually with the celebrities (Prince not included, though, seems fitting for a man who eschewed his name for a symbol :)) there’s a brief biography to go along with the image. But there’s not one here. Is she a child that you know personally? Maybe you stumbled across her, but didn’t add her history? I ask because I don’t see it. Rather, can she be any variation of 2 or more ethnicities? Definitely! But I can also see her being “mono-ethnic”. Asian and white might be tough, but her coloring seems light enough that I could see he as an adult considering herself white if, say, she grew up in southern Italy. She could definitely be a latina, as in two latino parents. A female actor that springs to mind (although she doesn’t particularly share her features specifically) is Gina Torres. Now people could say that both ethnically and culturally, much of latin America is based on the loose mixture of Spain, the different African countries, and the indigenous that were already there. So they’re mixed historically, as opposed to personally via the two parents. But if that is the case, then why not apply the same standard to U.S. born, U.S. descended black people? When I look at the little girl, I also see “monoethnic”. She could have two parents who the country would still consider black, and have identical features. Is it the hair? While that is a bit more uncommon, I have still seen black people with hair like the child’s, who have no known mixed parentage (parents & grandparents). Basically I wouldn’t know what the child’s ethnicity is until I had further info. And I sometimes I wonder if we haven’t actually gotten outside the boxing frame, but simply added a few more boxes to the mix. I quoted the first line for the obvious connection- I wonder if we are imagining a certain type of ethnic look when we think of bi or multiethnic people, which may inadvertently exclude many people who would be otherwise. But the 2nd line, for me, really stood out, not just in terms of this thread, but in so many things taking place right now. Because I wonder, why just begin multi-ethnicity with today’s progeny? Just like we acknowledge the general diversity in latino culture, maybe we should start doing that for the both U.S. born and U.S. descended white and black populations. It’s why I’ve been throwing quotes around the term “monoethnic”; neither one of those groups can truly be called monoethnic without using stiff, unnatural political constructs. And in speaking of cute, she does look quite adorable! Thanks for your very thoughtful response and for being a regular reader. I love the level of thought you have given this issue. 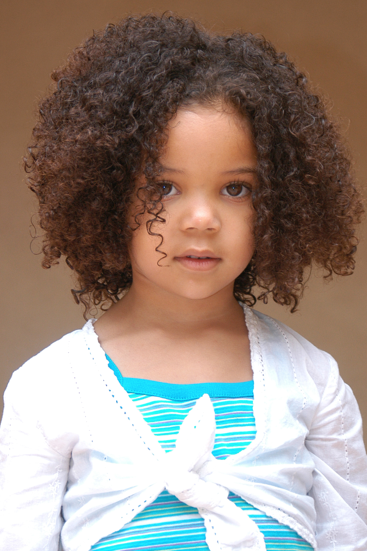 On this little girl she just happens to be a picture I found on a search of mixed kids. So not sure of the source of her “mixing.” But I agree she could be a wide variety of ethnicities based on her look. And you are correct when looking at pictures to post for the piece I had a very wide variety of options to choose from, from kids who looked more asian, to more black, to more white, to blue-eyed with dark skin, to curly blonde with dark skin, to almost “white” skin with a semi-afro. Indeed mixed people look many different ways including to not looking mixed at all. As I show with my “Mixed People Monday” posts (which focuses mostly on famous people) it is wide field. The girl in this post just happens to be the first I picked. Over time I will choose other kids who look very different. Another good point you made is that in defining “mixed” we could include almost everyone because I truly believe there are very few people who don’t have some ethnic mixing in their history, depending on how far back. So in defining “bi-racial” or “multi-racial” or mixed for the purposes of this blog and I think in some people’s conversations, the term is simplified to mean people whose parents are two (or more than two) different ethnicities. At least that is how I am using it. But you are correct, that the term is much more complex than that. I also agree that mixing has been going on for longer than now, but we can all agree that it is certainly becoming much more common these days than ever before, so certainly there is somewhat of a “momentum” to it as the world is interacting much more and sharing neighborhoods, schools and work, much more than before. However we define mixed or see mixed, I am just glad there are a lot more people out there who challenge our silly notions of racial purity, which as you say, hardly exists anyway. Thanks for commenting.